Before the draft, I looked in-depth at Ryan Pace’s draft trends from 2015-17 and used them to make predictions for what would happen in 2018. Well, it turns out Pace’s approach changed a good bit this year. Let’s look at those identified trends to see which ones were and were not followed. Go get your guy. The Bears reportedly tried to trade up from pick #8 to get somebody Ryan Pace really wanted. He continues to be very aggressive targeting his chosen players at the top of the draft. Replace a veteran. Every round one pick has been made to replace a high-profile veteran who recently left. That continued this year with Roquan Smith replacing Jerrell Freeman. Prototype prospects. Pace loves his athletes at the top of the draft, but that changed a bit this year. Roquan Smith is still extremely athletic, but he was not the physical prototype Tremaine Edmunds was. Pace went for the better player right now instead of the player with the highest ceiling, a definite shift in approach. Trade down. This definitely didn’t happen in 2018, which surprised me. The Bears stayed put at pick 39, and then traded up to got another 2nd round pick. Think big. The James Daniels pick was a classic Pace move on day 2, but Anthony Miller definitely was not. It marked the first time Pace spent a day 2 pick on a smaller player instead of somebody who plays in the trenches. This trend was not followed either. Athletic gamble. Pace continued to place a premium on athleticism on day 2, as both Daniels and Miller scored in the top 10% of athletes among their positional peers. Prioritize rounds 4-5. Pace traded away a 4th round pick and ended up with one selection in each round on day 3. His selections didn’t really seem to change their approach much in any round (more on that later). Get your little guys. This trend definitely didn’t continue either. The only little guy drafted on day 3 was WR Javon Wims in round 7. The first three picks were all front 7 defenders, not skill position players. Try, try again. Pace hasn’t been afraid to throw day 3 picks at positions that don’t necessarily need them right away, and that trend did continue in 2018. Two of the 4 picks on day three were on positions already addressed in days 1-2 (ILB Joel Iyiegbuniwe and WR Javon Wims), and only the selection of edge Kylie Fitts in round 6 could be viewed as addressing a dire need. Embrace the small school. This day three trend definitely continued in 2018, as half of the picks (LB Joel Iyiegbuniwe and DL Bilal Nichols) were from small schools. That roughly matches the small school rate from 2015-17. So what was Pace’s new approach instead? Here’s how I read the moves the Bears made in 2018. Plugging holes. For the first time, every pick made on days 1-2 was designed to plug a specific hole on this current roster (instead of taking the player you think will be best in the long run). The Bears needed the QB of the defense, so they grabbed Roquan Smith. They needed a plug and play starter on the interior offensive line, so they grabbed James Daniels. They needed a day 1 contributor in the slot at WR (remember, Taylor Gabriel is adamant about not being a slot), so they grabbed Anthony Miller (who can play inside or out, but was very productive in the slot in college). This approach tells me that Ryan Pace thinks the Bears are ready to compete now, which is why he’s drafting for 2018 instead of just the future. In hindsight, I probably should have seen this coming, because his free agency moves signaled the same thing. Improving team athleticism. Pace has always focused on athleticism on days 1-2, but that hadn’t translated to day 3 until this year. Every pick through 6 rounds ranked in the top 25% of athletes in the draft by their Relative Athletic Score. Drafting for succession. In the past, Pace needed guys who could play from day 1 in rounds 4-5, so he didn’t worry too much about athleticism. Now, he’s looking for depth and future contributors, and he wants athletes. I thought Jeff made a great point on Twitter Saturday when he noted the defenders drafted in rounds 4-6 were made with the intent of replacing guys ahead of them after a few years. The defense is mostly in place, so now the focus was on getting the next wave of guys when you can’t afford to pay everybody, and why not have them be great athletes who can contribute on special teams in the meantime? Back in February, I published a piece where I identified three physical thresholds for WRs and noted that every WR in Kansas City while Matt Nagy was there hit at least two of them. Anthony Miller hit all three of those thresholds, meaning that every major WR acquisition this offseason followed that same pattern of hitting at least 2 of 3. Though I still think letting Cam Meredith walk was a mistake, I love that Ryan Pace realized he needed more at WR and moved to get Anthony Miller. I love that he approached the position intelligently this offseason and got good players who are also good fits for this specific offense. And I love that we now have a pretty simple screening system to help identify guys in future drafts who might be Bears targets. Sticking with WR/pass catchers, the Bears now have a very versatile group. They have guys who win with size (Allen Robinson and Adam Shaheen), guys who win with speed (Taylor Gabriel and Trey Burton), and guys who win with quickness (Anthony Miller and Tarik Cohen). Add in Jordan Howard, and those are the top 7 skill position players. The Bears will mix and match such that 5 of them are on the field for most snaps, and will be able to throw a lot of different looks at defenses to test them in a variety of ways. All of those guys are also under contract for at least 2 years, and so is QB Mitchell Trubisky and the entire offensive line save RT Bobby Massie. In 12 months since drafting Mitchell Trubisky, Ryan Pace has drafted Tarik Cohen, Adam Shaheen, Anthony Miller, and James Daniels, signed Allen Robinson, Taylor Gabriel, and Trey Burton, and put together a coaching staff featuring Matt Nagy, Mark Helfrich, and Harry Hiestand. I have no idea if this is all going to work, but credit Pace for understanding how to support a young QB and help him develop. On paper, Trubisky has a good coaching staff to learn from, a good offensive line blocking for him, a good running game to lean on, and good pass targets to throw to, and that should be true for at least the next two years. There are no excuses. I still wish the Bears would have addressed edge rusher before the 6th round, and I still think that’s the weakest position group on the roster, but I’m not overly worried about it torpedoing their season like WR did last year. The Bears played the last 6 games in 2017 with an OLB group consisting of Sam Acho, Lamarr Houston, a gimpy Pernell McPhee, and Howard Jones, and the defense played at an adequate level. Even if some guys get hurt again, Vic Fangio is a good enough coordinator to keep the defense from completely imploding. I think they need a better group of edge rushers to be a top defense, but they can be a good one with what they have, and an adequate one even if injuries strike again. Realistically, not every one of their day three picks is going to pan out. In fact, they’ll be doing well if one of those three defenders turns into a solid starter. Pace hit on about half of his round 4 and 5 picks through 2017, so hopefully that continues in 2018. I have no clue if any undrafted free agent is going to pan out, but I really like that the Bears are going with a quantity approach at CB. If Deiondre’ Hall continues to be a safety, Pace has yet to spend a single draft pick at CB, and the only UDFA who have stuck around have been slot guys. This year they added three CBs as UDFAs, two of whom who are definitely boundary players and have the potential to develop in Kevin Tolliver from LSU and Michael Joseph from Dubuque. Both have the length and playing style that Vic Fangio typically likes in a boundary CB. The odds of either being a meaningful contributor in 2018 are very low, but hopefully at least one can stick around on the practice squad and have a chance to contribute in 2019. Other spots with shaky depth also saw several UDFA players added in the hopes that one might pan out, including three defensive ends and two outside linebackers. While we’re talking UDFA, I also like that they signed P Ryan Winslow. Again, I have no clue if he’s any good, but it’s some competition for Pat O’Donnell, which I think is wise. Here’s my best approximation at a depth chart right now. By my count, there are 89 players on the roster, so there’s room for one more (though more moves could be made if players are cut. For instance, I don’t think they’ll actually take 6 RBs to training camp, so Taquan Mizzell could be on the chopping block). I’d personally like to see a veteran safety added, and a few UDFA offensive tackles as well. Don’t pay too much to projected strings farther down. 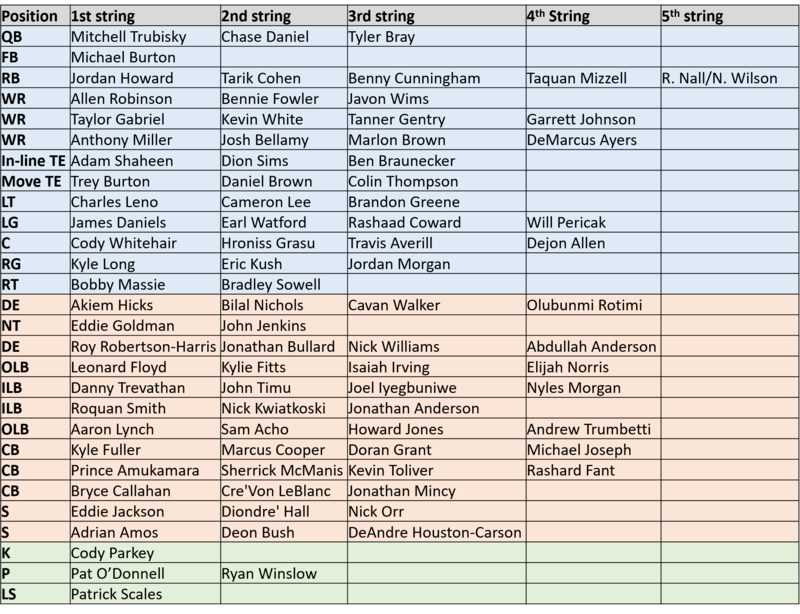 I just plugged in day 1-2 picks as starters, day 3 picks as backups, and UDFA at the end of the roster. Training camp will sort all that out.